On the south coast of the United Kingdom, a small IT team is making a big splash with their Microsoft Office SharePoint Server 2007 solution for schools. Starting with their own school, Twynham, Dave Coleman and his team of two Web developers, Chris McKinley and Darren White, and in partnership with Assistant Headteacher, Mike Herrity, designed a solution that was eagerly adopted by students, staff, and parents. The team followed this success by adding hosted sites for four additional schools. Then they hit the road to show the 63+ secondary schools in the area how to get up and running quickly with Office SharePoint Server. This article describes Twynham’s virtual learning environment, the solution architecture of Twynham’s implementation, and also the solution that Coleman’s team recommends for schools that are ready to get started with Office SharePoint Server. The SharePoint Products and Technologies teams at Microsoft are grateful to Coleman’s IT team at Twynham for collaborating with us on this project. The Twynham virtual learning environment is optimized to help the school excel at its core mission of educating students and preparing them for opportunities beyond their time at Twynham. In fact, Dave Coleman and his team put students at the center of the solution, with the goal of providing them everything that they could possibly provide online and giving them access to these resources from literally anywhere. For example, students can access class materials and blog about what they are learning during their travels to World War I sites in England or overseas trips to geological sites in New Zealand. To ensure student adoption, Coleman’s team involved students in the design of the virtual learning environment from the start. Coleman reports that his team observed students browsing the Internet and included the students in the design of page layouts. “We wanted to create an environment that students feel comfortable in and can navigate easily,” Coleman explained. The classroom sites are arranged by subject and year level. Teachers collaborate on the content that is offered on each subject site. For example, the French subject site incorporates RSS news feeds from French newspaper sites as well as links to other French media sites. One of the strategic investments of Coleman’s team includes the extensive library of media files and the integration of media resources within the various sites. Coleman’s team spent a summer digitizing media resources that were flagged by the Twynham staff as valuable for online learning. A terabyte of media files is hosted on a dedicated media server and available to the staff from within Office SharePoint Server. Teachers browse the library and drag and drop targeted media files into the subject sites. They can also easily integrate the media files directly into their classroom presentations. Twynham also makes extensive use of podcasts across many of the subject sites. Students can subscribe to the podcasts and listen to them on their MP3 players, mobile phones, and computers. Coleman reports that traditionally students sorted through a booklet of course descriptions. Based on the number of students changing courses after the start of classes, Coleman decided that he wanted to support students better in making these decisions. Coleman’s team achieved this by creating an interactive Web site with video clips of lessons, student interviews, and clear descriptions of the classes that students can choose from. At Twynham, the subjects available vary from student to student. When a student logs in to the site they only see subjects available to them. Each student is also interviewed by a staff member. Interview times and dates are displayed when they log in, along with the subjects they choose. Coleman’s team also developed a Web Part that allows students to submit questions to a subject teacher directly from the site. Another milestone for students at Twynham is preparing for the standardized exams that measure progress after two years of study. Students create a “revision plan” to review the course materials and prepare to answer the exam questions. To help students excel, Coleman’s team created a Revision Gateway home page (shown in the following image) that contains key exam preparation notices, materials from study-skills days, and navigation to all subject sites with study materials. The Revisions Gateway also includes past exams with model answers, links to external revision sites, and other information such as exam timetables. 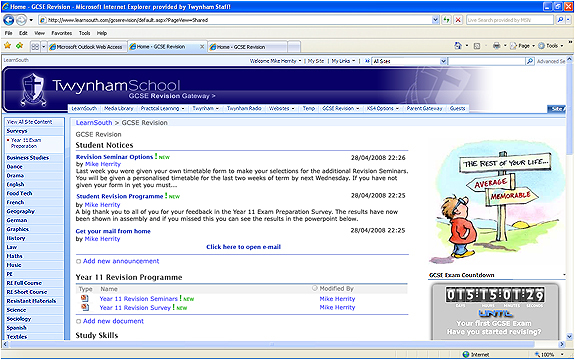 In the two months prior to the 2007 exams, Twynham Year 11 students viewed over 70,000 pages to prepare for their exams. 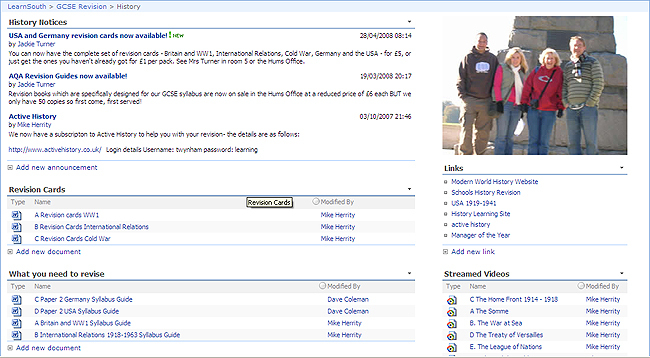 The following is an example of a history subject site dedicated to helping students score well on GCSE exams. The image is cropped, so the subject navigation in the left pane is not included in this picture. Another key initiative was introducing parents to the virtual learning environment and involving them in their students’ progress. Both parents and students can view the student’s home page. A student’s overall progress is easily tracked on a summary page (following), and both students and parents can view more detailed reports on attendance, schedules, and grades. The following image is cropped to highlight the summary reports. At Twynham, all students are provided with their own My Site, where they can store, access, and share their documents from any location. The following image highlights an example student My Site. My Sites allow students to create a public profile that they can use to present information about themselves. Students can save files to two different folders on their My Site: a Personal Documents folder that only they can access and a Shared Documents folder. 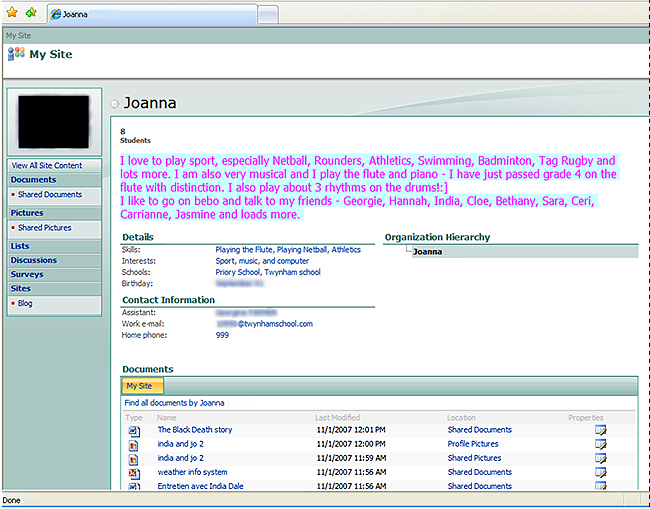 Documents that are saved to the Shared Documents folder are displayed on the student’s My Site home page. Students can assign permissions that define specifically who can view and modify these documents. Other users who view a student’s My Site will only see the shared documents that the student has given them permission to view or modify. In this way, a My Site enables student collaboration on group projects. Twynham’s solution architecture uses a five-server farm plus an extra server that hosts media files. Coleman notes that many schools can run Office SharePoint Server or Windows SharePoint Services on a single server. However, the Twynham team set some capacity and availability goals that called for a larger server farm. For example, the Twynham farm also hosts sites for at least four other schools. Perhaps the most interesting feature of the Twynham server farm is the dedicated media server. This server hosts a terabyte of media files, and the storage is directly attached to the second Web server. A port rule on the load balancer sends one hundred percent of media requests to this server. All other traffic is split 50-50 between the two Web servers. The server hardware includes the following. Each set of sites is grouped in a separate application pool. The Twynham Web site has been thoughtfully architected to serve the needs of an education institution. This site includes the public-facing school site as the top-level site collection. Content in this site in anonymously accessible and includes general information about the school, calendars, and newsletters. Beneath the public site collection is the site collection for all authenticated content, including sites for organizations and subjects. Organizations include dedicated sites for students, staff, and parents. The Governor organization oversees the school’s long-term future and is typically led by parents, similar to a school board in the United States. The Radio site hosts the school’s radio station presence. The bulk of the sites are dedicated to enabling student and staff collaboration on the school curriculum. Subject sites include sites dedicated to each student year group and a separate site for staff collaboration for the subject. The previous illustration shows the site taxonomy within the History subject. One of the goals of the IT team was to replace network shares with My Sites, greatly simplifying management of this content and providing students with remote access to their files as well as providing an easy way for students to manage permissions on their files and share their work. The sites for hosted schools are part of a project called LearnSouth, referring to Twynham’s education presence on the south coast of the United Kingdom. Again, student My Sites are isolated in a separate Web application. Within the LearnSouth site collection, schools (including Twynham) share media and revisions resources. The Media site is configured to only allow staff access to files in the library. This is because not all media is appropriate for younger students. Staff members can copy media files to subject sites, as appropriate. Each school receives a dedicated subsite within the site collection. All users of authenticated content are provided with an Active Directory account. The authentication method is Kerberos for everybody: students, staff, parents, and users of hosted schools. Account management is provided by a small company called SalamanderSoft (http://www.salamandersoft.co.uk). The Twynham sites are provisioned with the default zone for internal access and the Internet zone for external access. The hosted schools are provisioned with the default zone and are only accessed externally through the Internet. The Twynham solution implements two Shared Services Providers (SSPs). The default SSP serves the Twynham sites. This SSP is also configured to crawl content in the LearnSouth sites, where media and other resources are shared across schools. A second SSP is configured to serve the LearnSouth sites, providing isolation between the hosted sites and the Twynham sites. The configuration of SSPs allows the Twynham community to take advantage of all shared resources on the server farm while isolating hosted users to content that is appropriate for their schools. Coleman’s team uses AvePoint tools (www.avepoint.com) for backup and recovery. A single SSP is ample for a single-school implementation. However, it is worth putting more thought into site design, and this section provides several options. The design sample replicates Twynham’s site structure with one modification: the anonymously available public sites are placed in a separate Web application. You want to use zone policies to enforce permissions at the Web application level. For example, you can create a policy to deny write access to all unauthenticated users who view content on the public-facing sites. You want to manage collaborative content differently than the public-facing content. For example, you might want to back up class and subject sites more frequently or manage this content at a higher service level. You want to separate public-facing content from the collaborative content to reduce other types of risks. For example, you can give permissions to a small number of users to update the public-facing sites without worrying that their changes will affect sites in other Web applications. Also, issues with collaboration sites are less likely to affect the public-facing sites. While implementing a separate Web application for anonymously available public sites is a good option to consider, the design as currently implemented by Twynham also represents solid architecture and reduces the complexity of the overall solution. For example, consolidating the public sites and the collaborative sites into one Web application can reduce the number of databases to manage, depending on how you configure database settings. Placing My Sites in a separate Web application is always recommended. See Design My Sites architecture for more information about configuring specific architectural settings related to hosting these types of sites. By far, the most important aspect of a solution design for a school to thoughtfully consider is the taxonomy and hierarchy of collaboration sites. Twynham’s design illustrates a common way to organize sites based on educators who specialize in teaching a specific subject to multiple age groups. The Twynham site structure optimizes collaboration for single subjects. The following design sample provides an alternative site hierarchy to consider for primary schools in which educators specialize in teaching multiple subjects to a specific grade level or year group. This sample utilizes U.S. English terms for primary schools (“PTSA” instead of “Governors” and “grade” instead of “year”). Curriculum sites are organized first by grade level and then by subject. This example shows the drill-down for grade 3, which allows grade-3 teachers to easily collaborate across the grade-3 curriculum. This also scales well for collaboration across multiple schools. Classroom sites provide sites for teachers to post announcements, assignments, and teaching resources that are specifically targeted to their students. Classroom sites — Consider your audience for classroom sites. For primary grades, educators generally encourage greater parent involvement in student learning. Many teachers use classroom sites to keep parents informed and to make homework assignments and study aids available at home. If you plan to make your classroom sites anonymously available and you have designed a separate Web application for public-facing sites, you could consider placing classroom sites in the Web application with the public-facing sites. Curriculum sites — At Twynham, curriculum sites represent the primary online collaboration space between students and teachers (rather than classroom sites as illustrated in the previous diagram). Parents do not have access to subject sites, and there is a separate site within each subject site specifically for teachers to collaborate with each other (students do not have permission to this site). This site architecture and permissions structure makes sense for schools that cater to older students. In contrast, curriculum sites for primary schools are often optimized for collaboration among teachers of the same grade level across classrooms or schools and it may not be appropriate to allow students access to curriculum sites. The classroom sites are typically a better forum for facilitating student and parent interaction. Media repositories — The Twynham team manages permissions to media resources by exposing these resources through one site in which only the teachers have access. Coleman notes that teachers can drag and drop media files into their subject sites, which are configured with permissions that are appropriate for the student audience. In this way, Twynham’s site architecture and permissions strategy is sensitive to the various needs of its audience. While this article and the design samples provide ideas for site hierarchies and permission strategies, the adoption and success of your solution depends on how well it serves the needs of your organization. Of all the aspects that make up your solution design, the site hierarchies, taxonomies, and governance strategy related to sites will be the most important in which to involve your user community. For more information about planning and designing these aspects, see Plan governance. This TechNet article provides links to articles and other resources. The design for users, zones, and authentication incorporates two entry paths: internal access and external, or remote, access. Consider simplifying account management and authentication by providing only external access to sites, similar to Twynham’s solution for hosted schools: students and staff log in as if they were remote, whether they are at home or at school. With this design, users don’t have to remember two different sets of URLs based on internal and external access. If you do implement two different zones for users to access sites, be sure to coordinate zones and authentication and to pay attention to account issues related to external access through a firewall. The design sample for a single school differs from the Twynham design by assigning the default zone to external access. There are several requirements that apply to the configuration of the default zone that potentially make this a better choice for most designs. For example, the default zone must be the most secure zone, because when a user request cannot be associated with a zone, the authentication and policies of the default zone are applied. For more information about other requirements, see “Configuration requirements of the default zone” in Logical architecture components. If users are accessing sites from two different zones, ensure that the solution allows them to use the same login credentials. If users log in with different credentials (for example, using forms authentication credentials externally but Windows authentication internally), Office SharePoint Server creates two different accounts for each user, which is strongly discouraged. Be sure to coordinate authentication with your firewall or gateway product. There are several strategies for coordinating authentication to ensure that the server running Office SharePoint Server receives Windows credentials. For information, see “Users, zones, and authentication” in the following design sample: Logical architecture model: Corporate deployment. This design sample incorporates the features of Office SharePoint Server. You can easily incorporate this design sample using Windows SharePoint Services by omitting the Shared Services Provider (SSP) and My Sites. Connects you to the top Microsoft resources for educators, including solutions and services for IT teams. This solutions framework can help you integrate many of the tools you already use (Microsoft and those of other companies) to better connect people, information, and processes. This roadmap is designed to help educators worldwide determine how they can build schools, colleges, and universities designed for 21st Century Learning. Distribute and work together on assignments with students. Grade assignments based on multiple criteria they choose, and then combine those scores into a final grade. Plan courses and curriculum—even to the detail of including learning and assessment activities. Lesson plans, networking, and more. This article describes a specific implementation of SharePoint Products and Technologies and provides design ideas for similar solutions. Let us know if you find this approach useful. If you would like to see similar design samples for other types of solutions, give feedback on this article and let us know what you would like to see.